Every year hundreds of photographers and thrill seekers travel to haunt Isla De Las Mulecas (island of the Dolls). That doesn’t mean it’s a tourist destination. 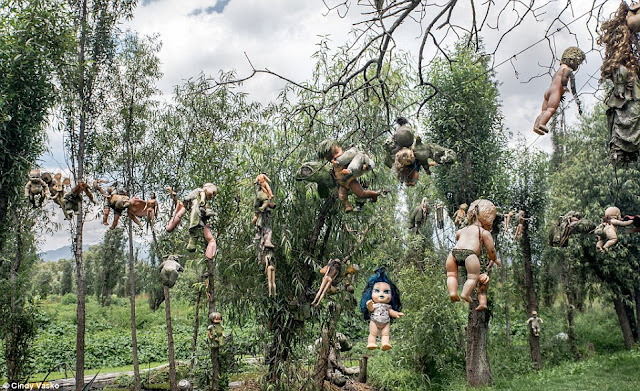 After a two-hour canal ride from Mexico City, a nightmarish clearing deep in the woods where thousands of mutilated dolls hang from the trees and hide among the dense branches. A reclusive Mexican man who believed dedicated to the soul of young girl, appease the troubled ghost who passed away at a tender age there over 50 years ago, still haunts the woods today. 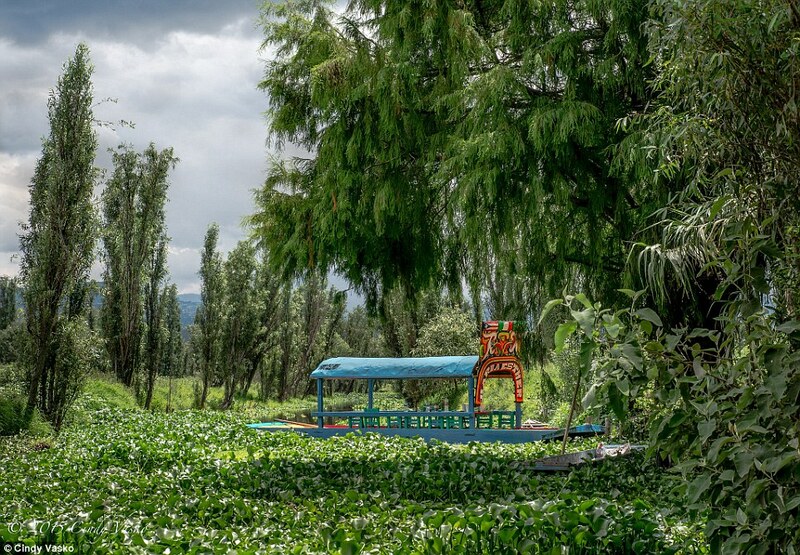 It is also known locally as the 'chinampas' where, grew vegetables and flowers to sell in the nearest town but never spoke to anyone while he was there. The island of dolls is a creepiest destination in Xochimilco, Mexico. 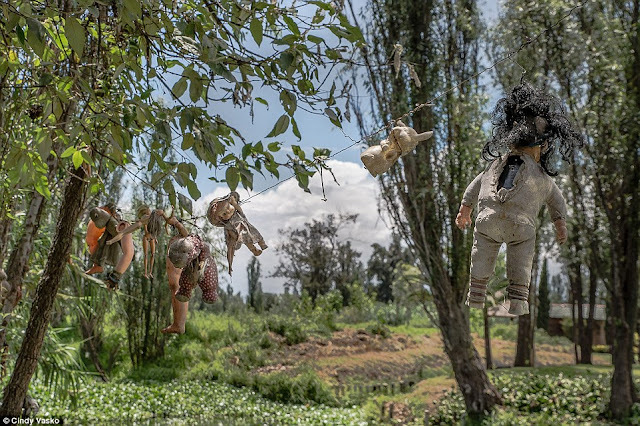 It was a floating garden, now home to hundreds of terrifying, mutilated dolls. Their severed limbs, decapitated heads, and blank eyes hung on trees, fences and nearly every available surface. 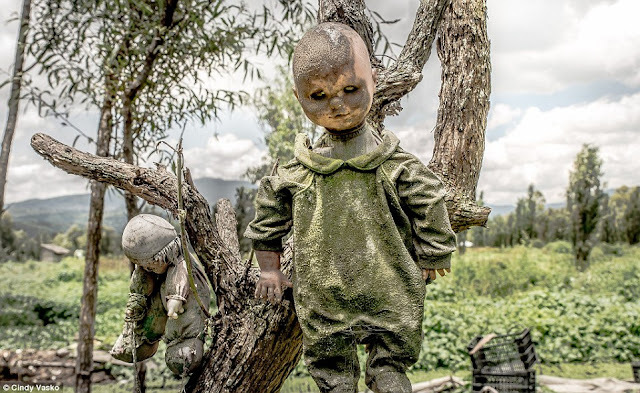 The dolls appear menacing even in the bright light of midday, but in the dark they are particularly haunting. The tragic story behind this haunted island lies occurred in 1950. Don Julian Santana Barrera was the only dweller and caretaker of the island. He found a little girl drowned, in a canal surrounding the island strangely. He wasn’t able to save her life. Hence, shortly thereafter, Julian saw a floating doll near the canal, assuming it to be the girl’s doll. 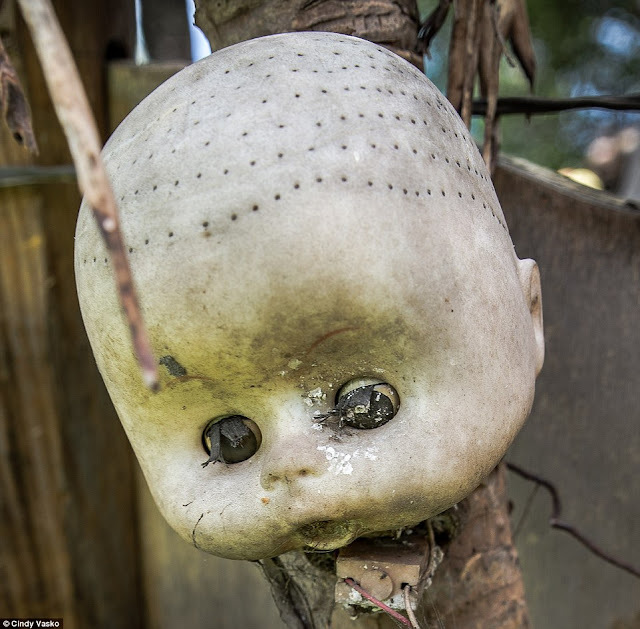 He later discovered a doll floating in the same waters and, assuming it belonged to the deceased girl, hung it from a tree as a sign of respect. His descent into madness began with this seemingly innocent act. He was feeling so guilty of not saving the girl’s life. She has made Julian restless. He felt that the island was haunted by the girl’s spirit. Only one doll, he felt was not enough to please the child, he felt the girl needed company. 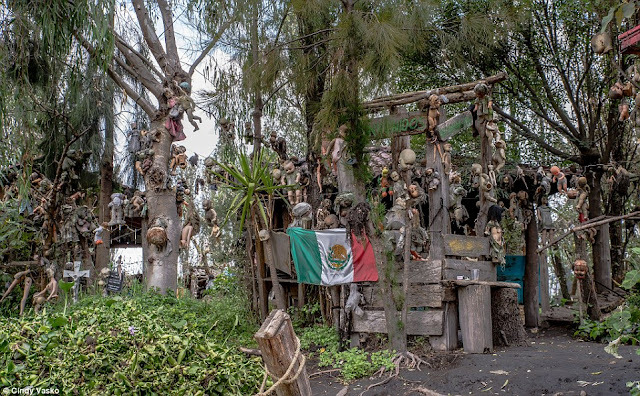 Barrera began to hear whispers, footsteps and the anguished wails of a woman in the darkness even though his hut - hidden deep inside the woods of Xochimilco - was miles away from civilization. 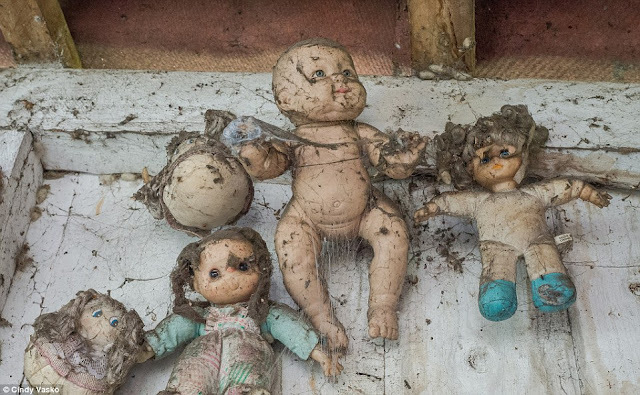 Terrified by the spirit, he started collecting dolls. 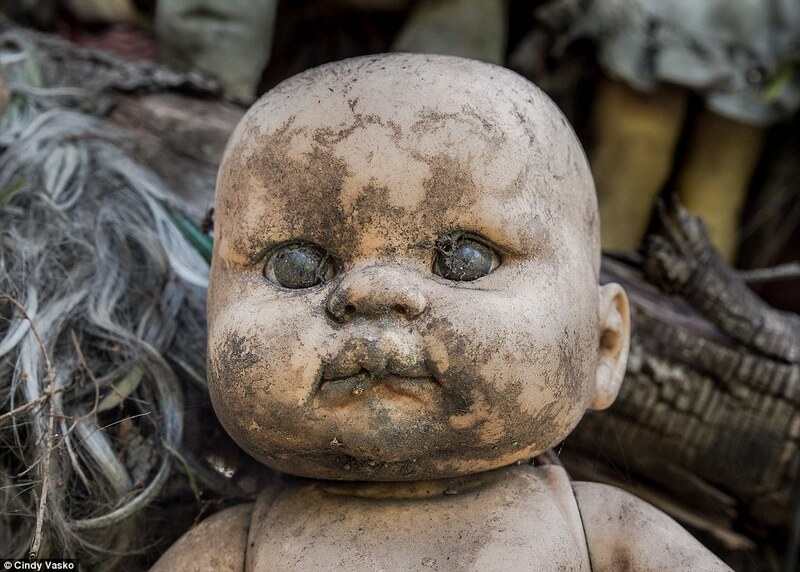 He would find in the canal, from heaps of trash and hundreds of toys. 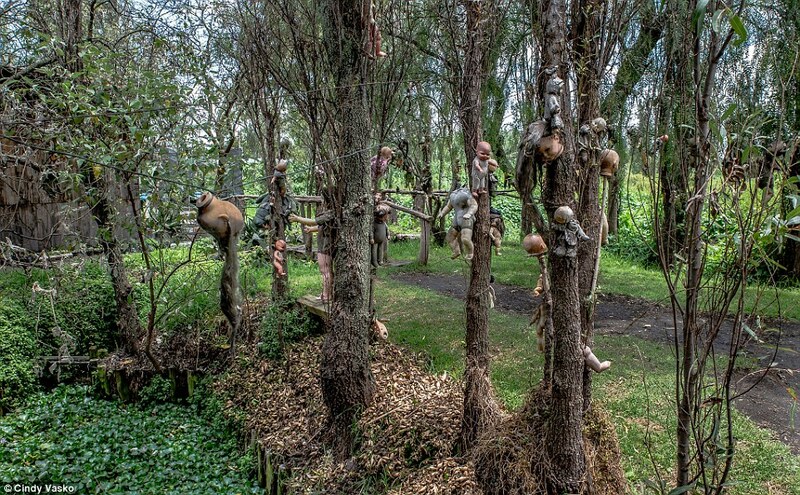 Then some missing body parts from the trees and the wire fencing which surrounded his wooden shack. 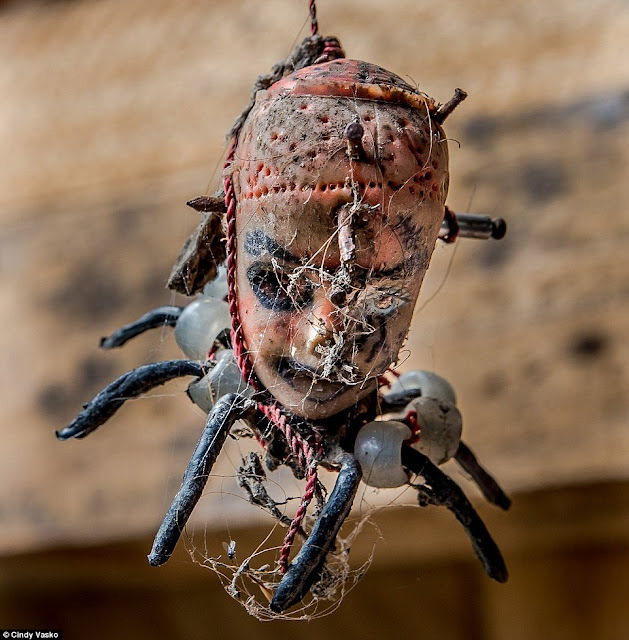 Over half a century, he collected more than 1,500 of these little horrors. All the dolls are still there untouched. They look like decaying corpses of children. 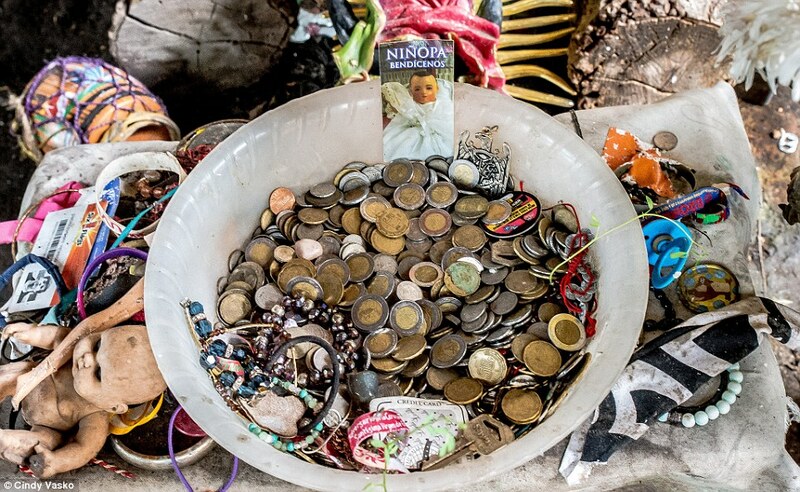 Later Santana died of a heart attack in 2001, and a small white cross near the water marks his grave. 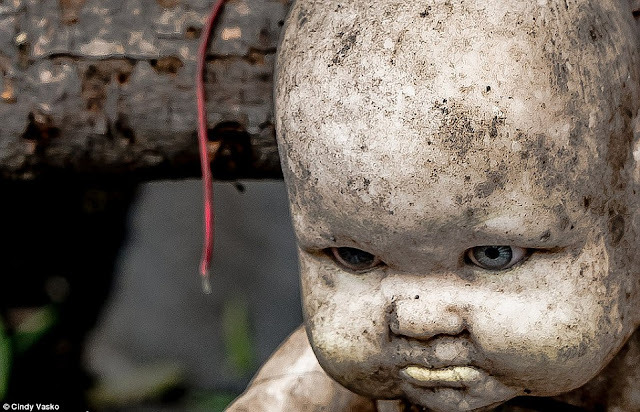 Some stories say that he was found drowned in the canal in the same manner as the dead girl. Julian Santana Barrera retreated to the woods soon after she drowned in the nearby canal. 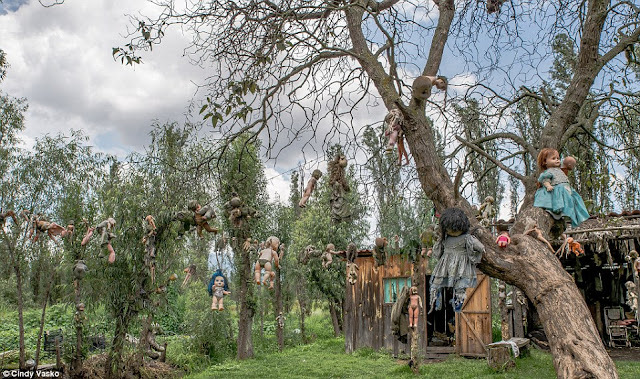 Driven by fear, he hung the dismembered toys from the trees to protect himself from her ghost and spent the next 50 years 'decorating' the woods in a desperate attempt to appease her. He was also claimed that he could hear her tormented screams and footsteps in the darkness. However, the truth behind the story is still a mystery. Some even doubt the existence of the drowned girl. Some say Julian had made up this story in his loneliness. Some say that Julian had gone mad and felt that the dolls were the tortured spirits of children who passed early. People close to Julian say that it felt as if he was driven by a certain force, which had changed him completely. Even today after the 14 years of his own mysterious death in those woods. 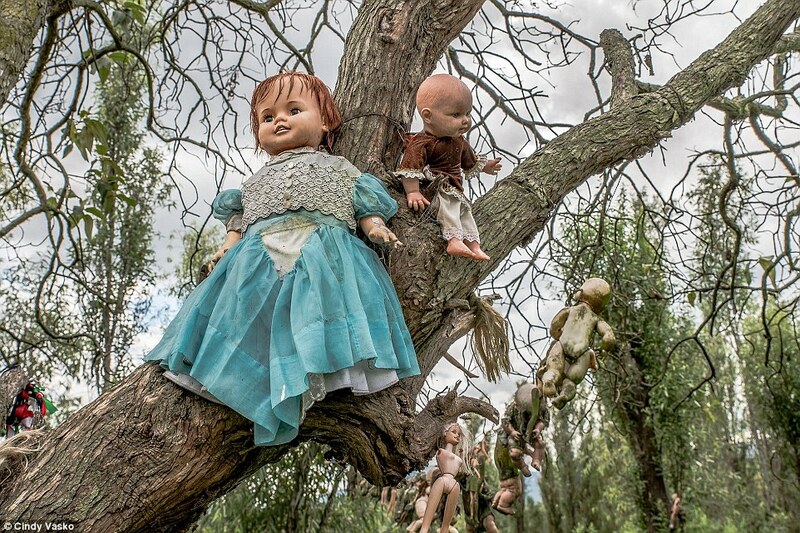 The visitors say they hear whispers in the night and feel the dolls' eyes following them through the trees. Providence Canyon is about 150 miles southwest of Atlanta, in the US state of Georgia. 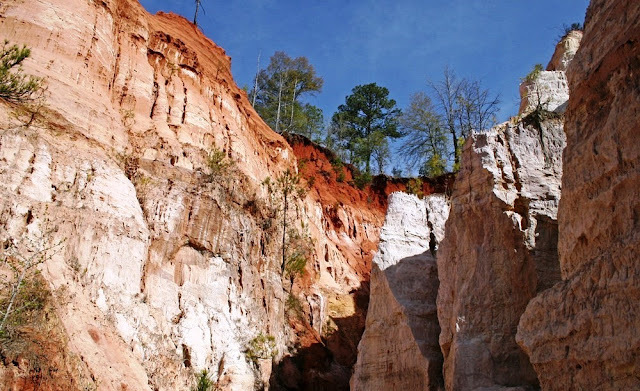 This is a network of gorges and huge gullies lovingly called Georgia's “Little Grand Canyon.” Providence Canyon is considered to be one of Georgia’s “Seven Natural Wonders”. 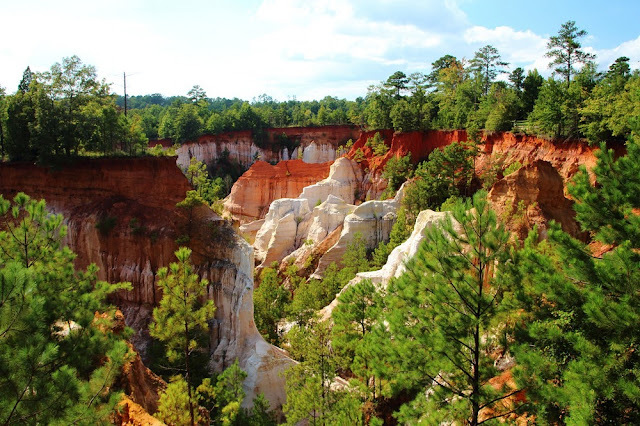 Providence Canyon is a perfect example of a testament to the power of man’s influence on the land. Surprisingly it isn’t at all natural. 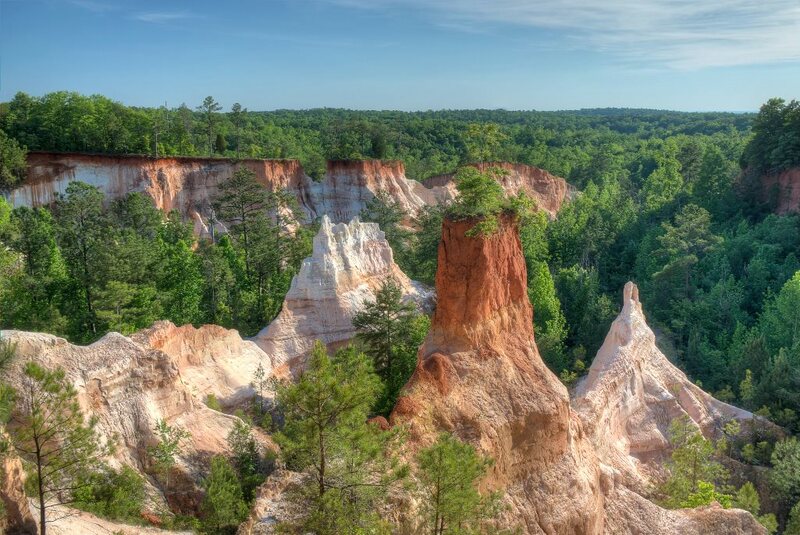 Many Georgians aren't aware of Providence Canyon It's situated in an outdoor recreation area that encompasses 1,103 acres and 16 canyons. These imposing canyons were formed not by the action of a river, erosion of more than millions. It is of years by rainwater runoff from farm fields in less than a century. 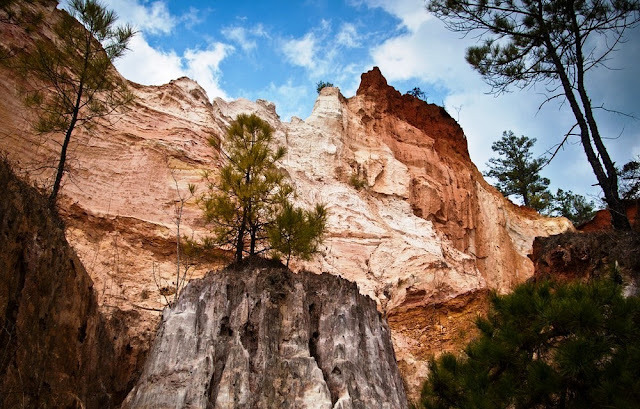 The canyon exquisitely-hued sediment walls are a product of inexperienced farmers making a colossal mess of things, and Mother Nature just kind of worked with it from there. 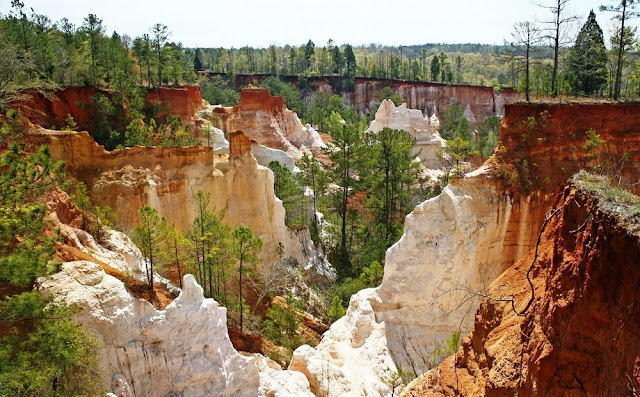 Providence Canyon started creating in the start of 18th century due to poor farming practices. That prevailed across the nation and especially in the south. In those days, land and agriculture was very cheap, infinite and seemingly expendable giving way to a combination of plantations. A small farms sooner or later a sharecropper system that not only degraded the land. Hence it also kept farmers in debt and uneducated. Native forest cover was cleared so the land could be farmed. No measures were taken to avoid soil erosion leading to huge loss of topsoil. Therefore, small gullies started to form and speedily grew deeper and more extensive, until they were three to five feet deep by the 1850s. These small channels started to further focus runoff increasing the rate of erosion. 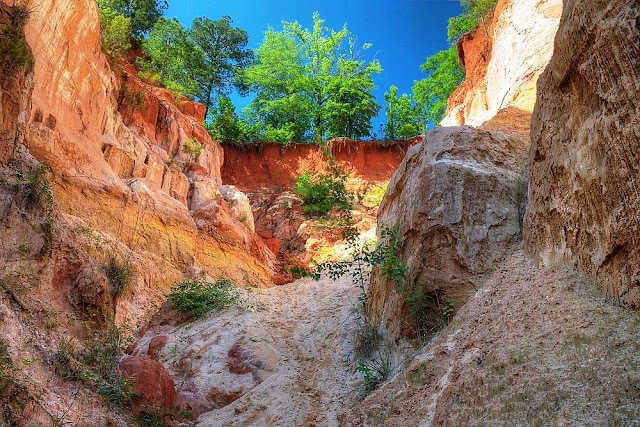 Nowadays, some of the gullies at Providence Canyon are about 150 feet deep. 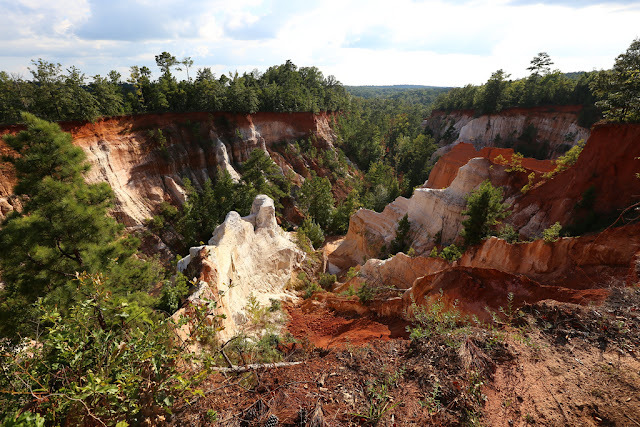 In spite of its current formation, Providence Canyon is a treasure trove for geologists and visitors. Because, over the times passes, erosion has exposed the geologic record of many million years within its walls. The minerals have stained the sediments, making a wide range of colors. The Canyons are lies in a region that was formed by deposition of marine sediments between somewhere 60 to 74 million years ago. 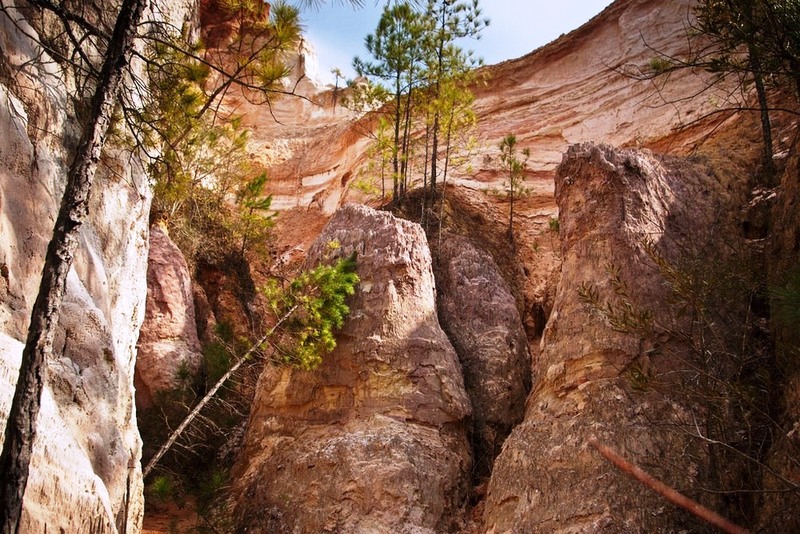 Moreover, the soil in the top part of the canyon wall was deposited about 65 million years ago. It was just after the age of the dinosaurs. It’s fairly coarse sand is a reddish color caused by the presence of iron oxide. Providence Canyon continues to erode, however, the floor of the canyon is more resistant and growth of pine trees, buses and other vegetation has helped stabilize the soil. Underneath this formation lies what is acknowledged as the Providence Sand. It makes up most of the canyon walls. It is 119 feet thick and was deposited about 72 million years ago. The upper part of this layer is very fine sand mixed with white clay. 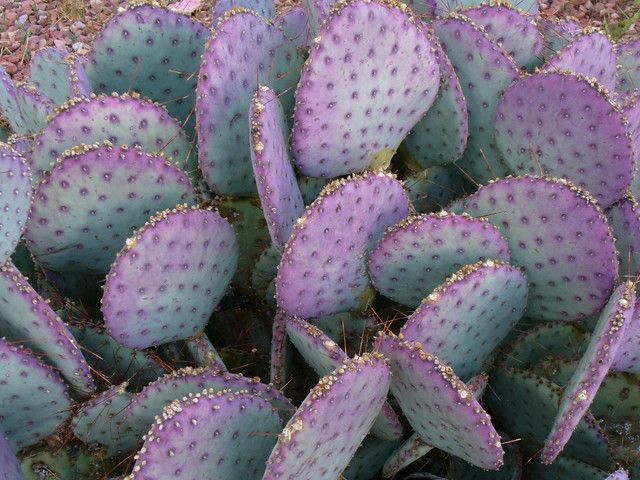 Thus, the middle layer is coarse and more intriguing, with beds of yellow (limonite) and purple (manganese) deposits. The lowest and oldest layer is black and yellow mica-rich clay. In addition to sightseeing and taking photographs, Georgia's Little Grand Canyon offers the many activities, i.e. hiking, camping, stargazing, picnic, and geological. 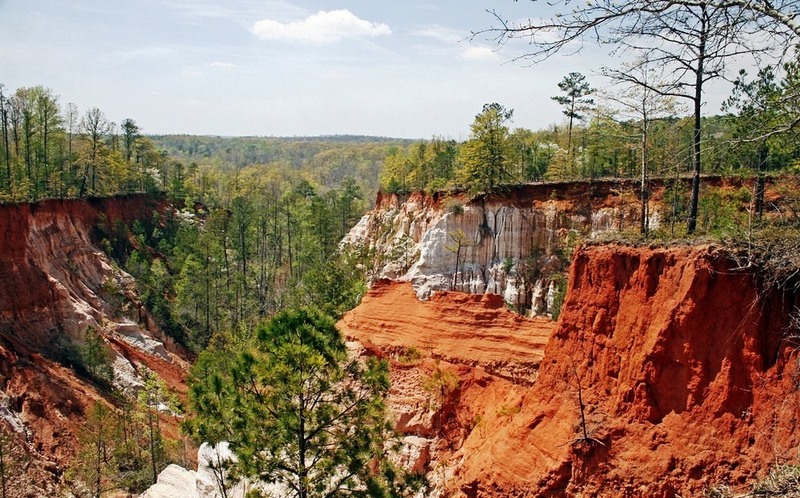 The bottom of the Providence Canyon floor was deposited about 75 million years ago. Its orange color is poorly exposed and overgrown by vegetation. Visitors are advised to enjoy views of canyons from the rim trail, but need to stay behind fences and off the fragile canyon edge. Providence Canyon has a few other eccentricities that make it stand out from your standard canyon hike. Hiker’s likes to explore the deepest canyons will usually find a thin layer of water along the trail, indication of the water table below. 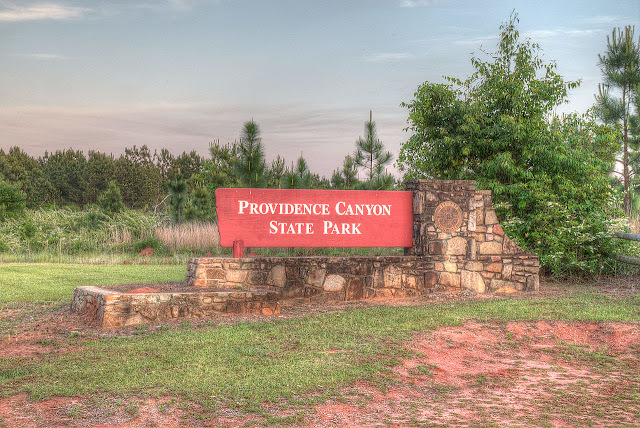 There is a playground, picnic tables and overnight campgrounds available, with several trails of varying difficulty. 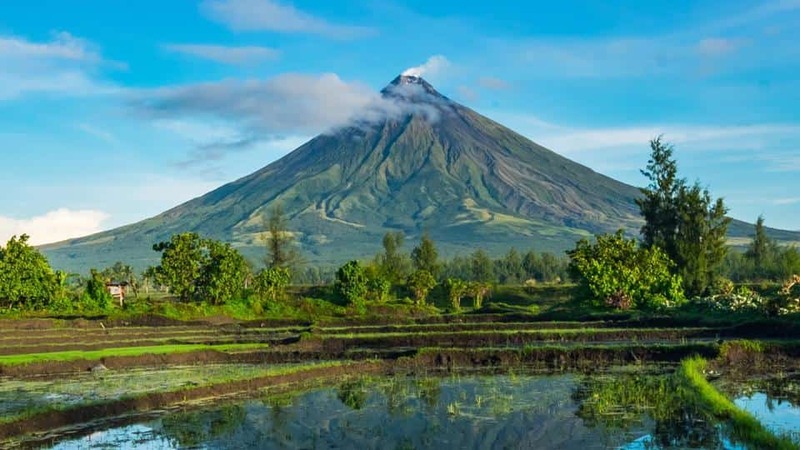 Mount Mayon, also known as the Mayon Volcano, is an active stratovolcano with a small central summit crater on the island of Luzon in the island of Luzon in Philippines. The Philippines, which has a population of 103,775,002, became an independent state in 1946, after gaining its sovereignty from Spain. 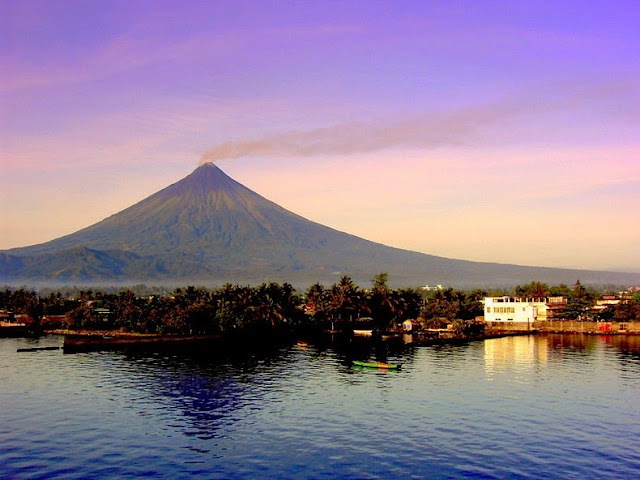 The Mount Mayon is renowned for its almost symmetric conical shape. 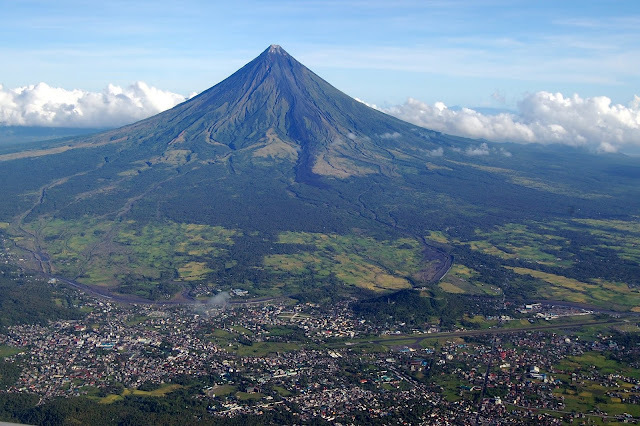 Mayon is considered to have the world's most perfectly formed cone due to its symmetry. It was formed through layers of pyroclastic and lava flows from past eruptions and erosion. Mayon is a part of the Pacific Ring of Fire. Mayon, in north-eastern Albay province, is the most active volcano in the Philippines having erupted about 50 times in the last 500 years. 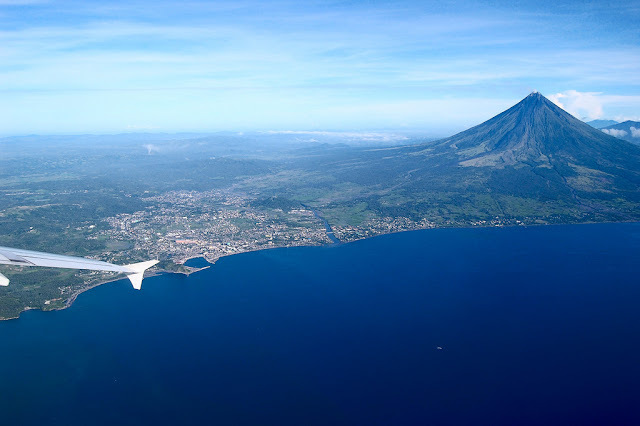 The distinctiveness of Mayon volcano is geographically shared by the eight cities and municipalities which meet at the cone’s summit, dividing the cone like slices of a pie when viewed from above. 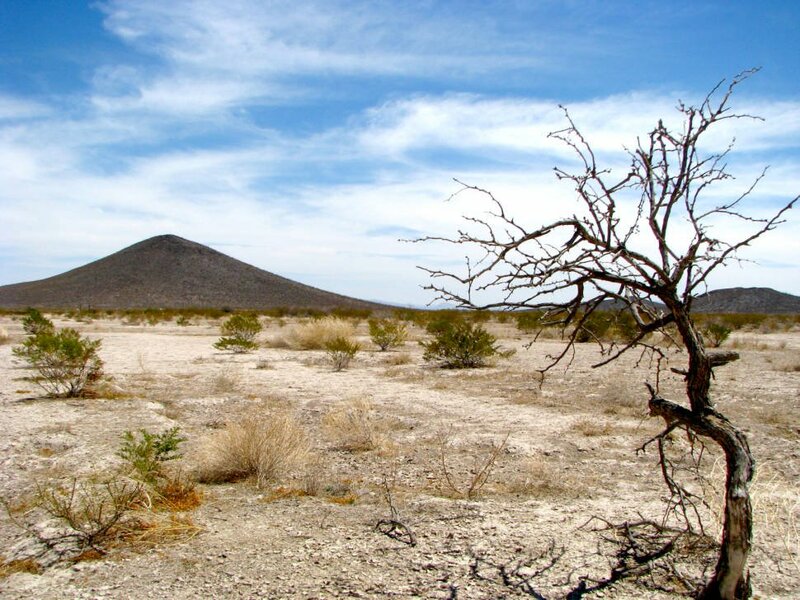 There are many festivals and rituals are associated with the volcano and its landscape. 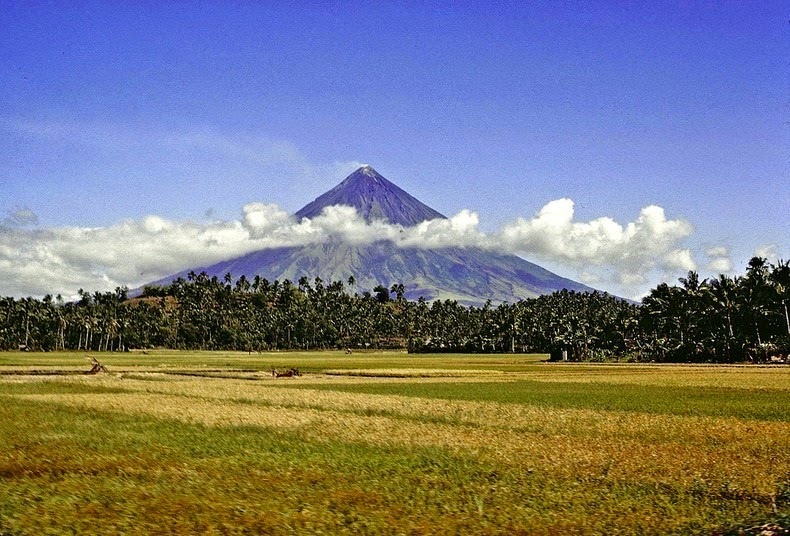 The most destructive eruption of Mayon occurred on in Feb 1, 1814. Lava was flowed belched dark ash 30ft in depth and eventually bombarded the town of Cagsawa 1200 locals perished with tephra that buried it. Trees burned, and rivers damaged and proximate areas were devastated by the eruption. Moreover, another massive eruption recorded in 1881. Everyone had to leave their homes, rice, vegetables and poultry farms within the danger zone. 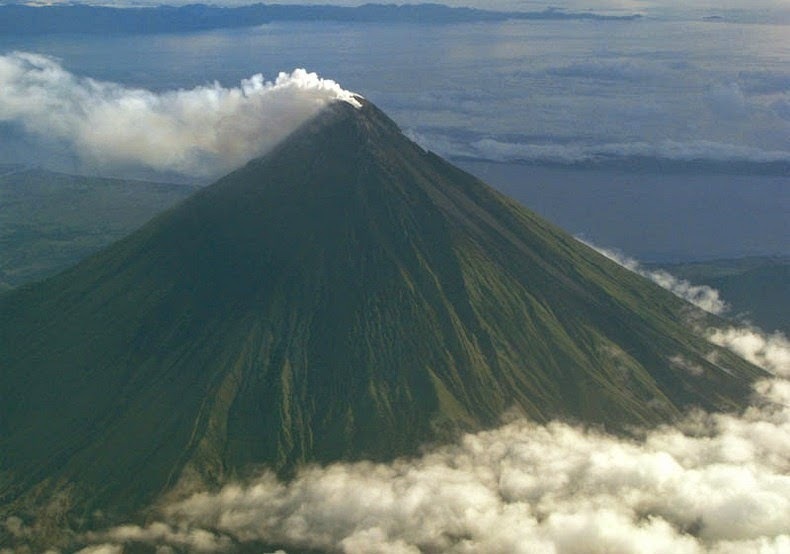 When Mayon underwent a strong volcano had poured out, for five months continuously, a stream of lava on the Legaspi side from the very summit. The viscid mass bubbled quietly but grandly, and overran the border of the crater, descending several hundred feet in a glowing wave, like red-hot iron. An eruption in 1993 caused 79 deaths. 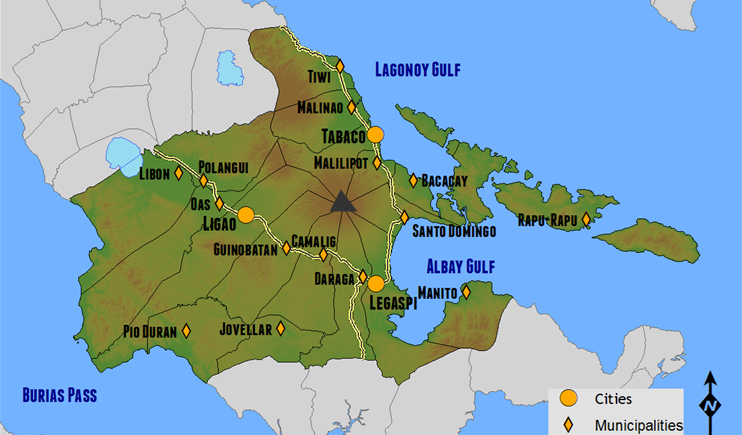 And subsequent eruptions in 2000, 2006, 2009, 2014, and 2018 forced tens of thousands of people in nearby villages to evacuate. The active volcano has managed to retain its perfect cone shape without suffering any major slides or collapse. 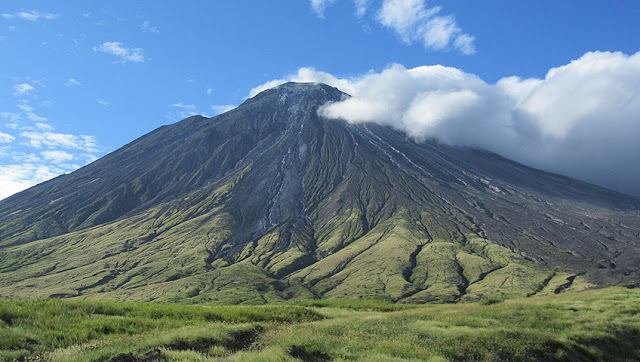 The volcano is the centerpiece of the Albay Biosphere Reserve, declared by UNESCO in 2016. 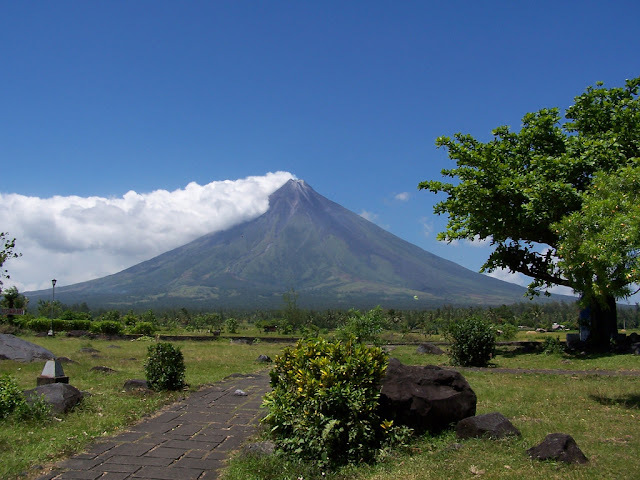 The main landmark is rising 2462 meters above the Albay Gulf. It has very steep upper slopes averaging 35 to 40 degrees capped by a small summit crater. Due to its perfect symmetric cone, the mountain was declared a national park and a protected landscape on July 20, 1938. It was also reclassified a Natural Park and renamed as the Mayon Volcano Natural Park in 2000. Mount Mayon is the most active volcano in the Philippines. Hence its activity is regularly monitored by PHIVOLCS from their provincial headquarters on Ligñon Hill, about 12KM SSE from the summit. 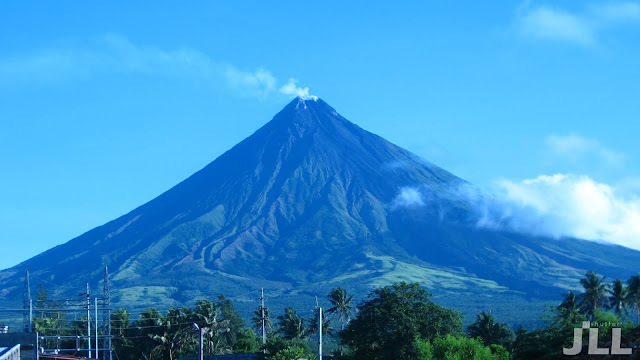 Three telemetric units are installed on Mayon's slopes, which relay information to the seven seismometers in different locations around the volcano and back to the Ligñon Hill observatory and the PHIVOLCS central headquarters. 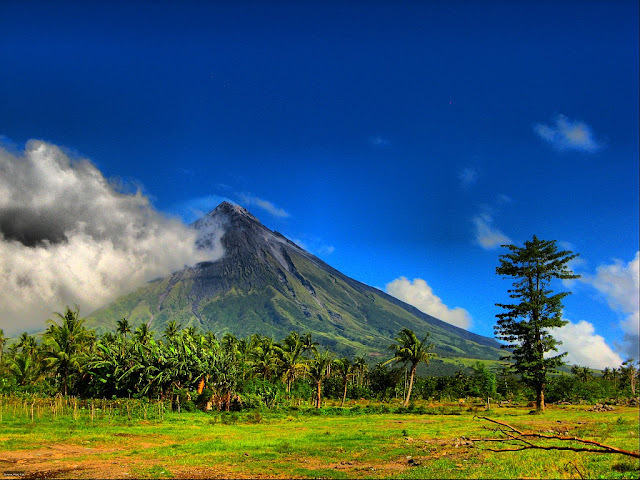 Despite of all facts, Mount Mayon is a popular destination for climbers and tourists. Lanikai Beach is ranked among the best beaches in the world. The half mile strip of Lanikai Beach is located in Lanikai, in the town of Kailua on the windward coast of Oahu, Hawaii. 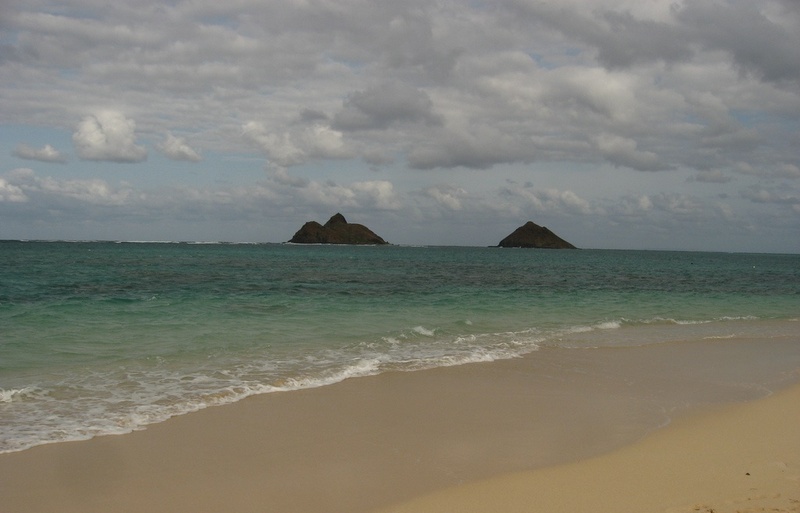 Like several beaches in Hawaii, Lanikai Beach is public property, not a state land. The beach water temperatures are normally 24–26 °C so you can spend plenty of time in the water. The beach itself position is very unique, as you can watch the moonrise over the Mokuluas, especially during the full moon. 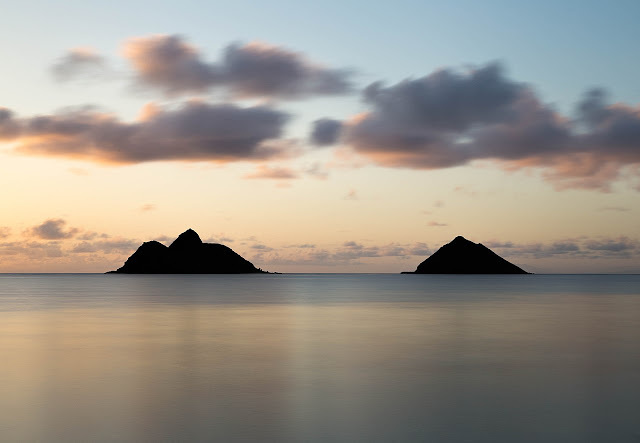 Sporadically during the year the sun will rise directly between the Na Mokulua islands. This hidden gem is not connected to Kailua beach, so most tourists pass it up. Lanikai Beach is populated mostly by locals, the rich and famous and the occasional wedding at Sunset. 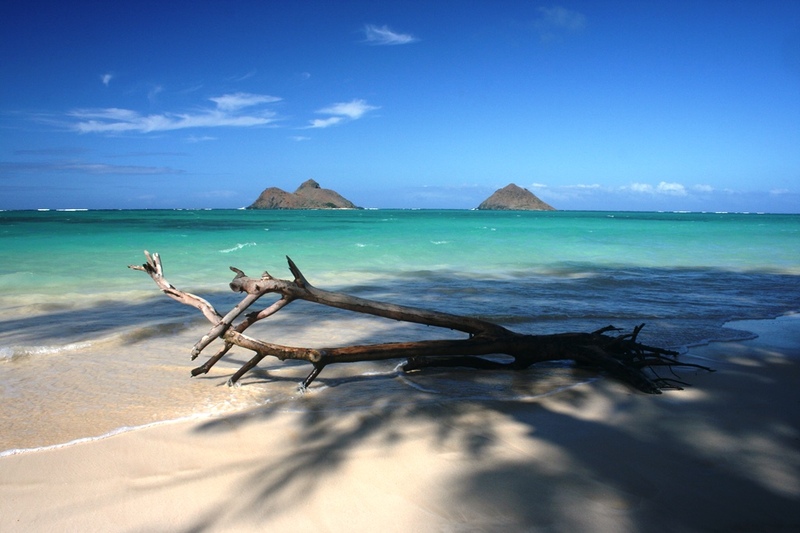 However, Lanikai Beach is most famous among Hawaii peoples, but lacking several public facilities. Peoples are having problems like, no parking lot, restrooms, shower and lifeguards. 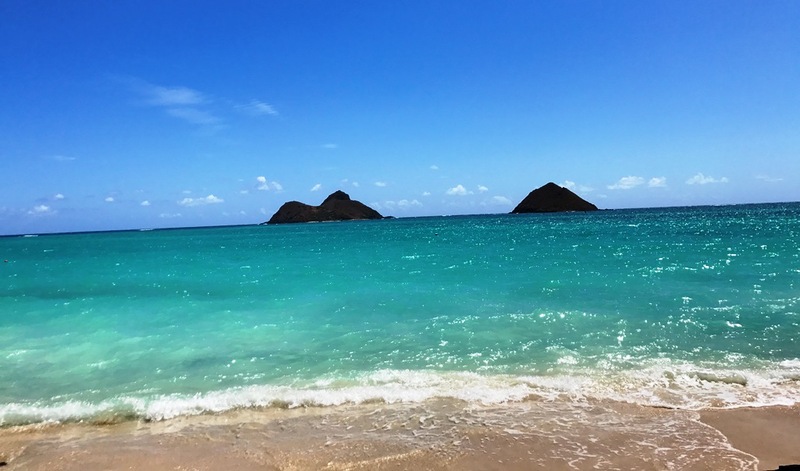 The Lanikai means ‘Heavenly Sea’. Adjacent to Lanikai Beach is a mainly upper-class residential area, accessible through public beach access paths. This magnificent beach has extremely soft powdery clean white sand. Peoples are constraint to violate parking lot due to no near parking area. Although, parking violation fines have increased in order to keep people from illegally parking in the residential area. There are legal parking areas in downtown Kailua, where you have to take the bus to the beach for a rational fee. Parking violations are strictly enforced and include, but are not limited to, no parking within four feet of a driveway entrance or apron, blocking the unimproved pedestrian right of way. The beach cove on one of the small islands and the surf between the two are big draws to kyakers and surfers. 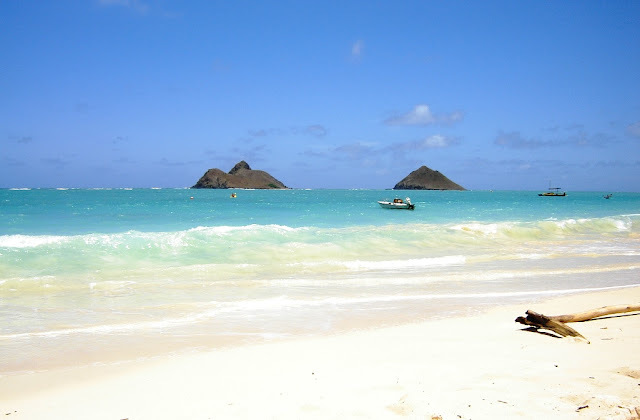 The best time to go to Lanikai Beach is in weekdays due to less crowded compared to weekends. Even it is still very problematic to find parking close to public beach accesses. So, one can imagine the plight of parking on weekends. 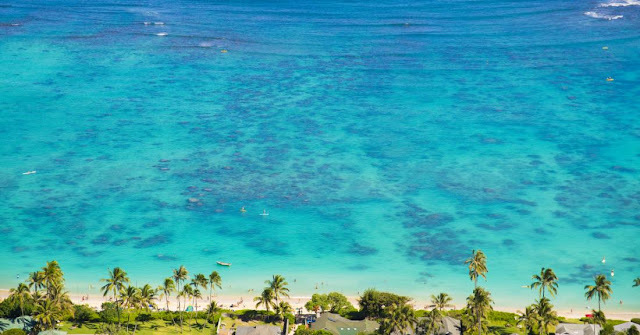 The Lanikai Beach overcrowded during summer and winter vacation seasons. In those days, beach is completely parked every single day. This is a great place to swim with the Hawaiian Green Sea turtles because the reef protects it from the big Hawaiian surf. Bring plenty of sunblock as there is not much shade when on the beach. The Lanikai Beach is famous spot for photo lovers; they regularly shoot videos on nice days. The special thing about this beach, having the two Islands in the background. Which attract photographers to make their photoshoot plan here? The background called Na Mokulua or Mokes. 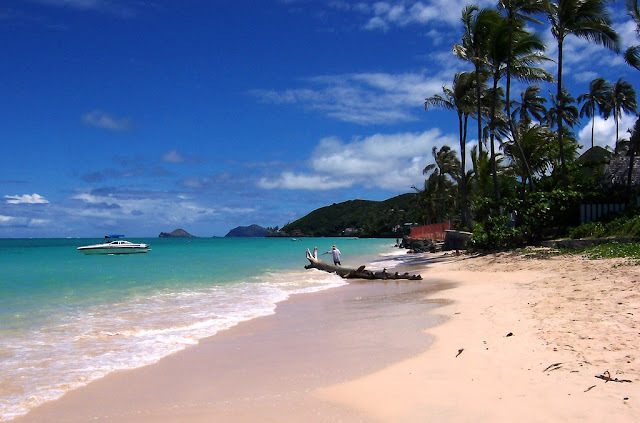 Lanikai Beach is consistently voted as one of the best beaches in the United States. This is the only beach in the USA that was voted as one of the best beaches in the world. The beach is Flat Island which is a bird sanctuary and destination for swimmers and kyakers alike. Moreover, myriad shade trees line the sand and shade a large park with many picnic tables, a bike path and bathroom/shower facilities. The magical aqua blue calm waters are perfect for swimming, but not at all good for snorkeling. There is no reef to attract the fish. The water can also become a little cloudy from the fine sand stirring up from the bottom shoreline. Kayaking is a fantastic way to enjoy in at Lanikai calm waters. This is an exclusive two hour adventure that you must plan and head to sign up before arriving at the beach. It includes transportation, lunch, snorkel gear, life jacket, dry bag, and caters to beginners to more advanced kayakers. It’s a peaceful setting that promotes a relaxing setting for everyone to enjoy! Make sure, also remember to be well-mannered to the local residents, and clean up after yourselves when leaving the beach. 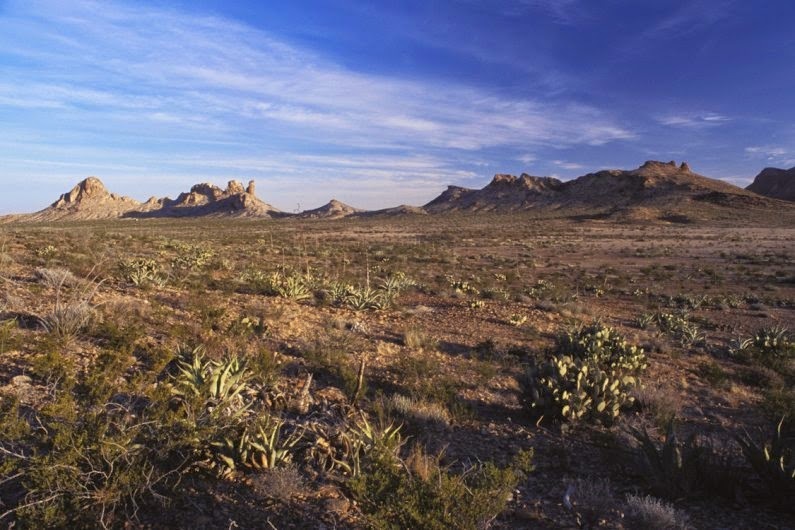 The Mapimí Silent Zone is the popular name for a desert patch near the Bolsón de Mapimí in Durango, Mexico. 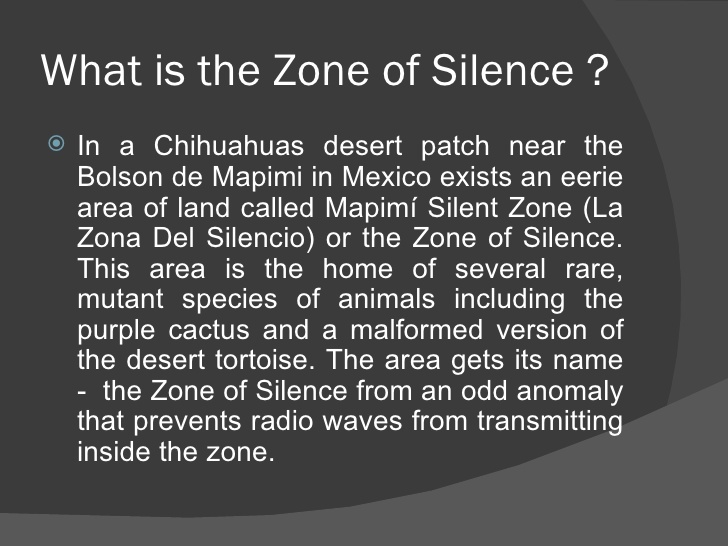 It is the subject of an urban lore that claims it is a zone where radio signals and any type of communications cannot be receives overlapping the Mapimí Biosphere Reserve. You’re cut off from the rest of the world, gadgets stop working like cellphones, radio, or compass everything breaks down when you enter this land. Researchers have dubbed this zone as the ‘Mar de Tetys’, or the Sea of Thetys. This area was once completely submerged in water. The area has evidenced by traces of marine life fossils found in the area. 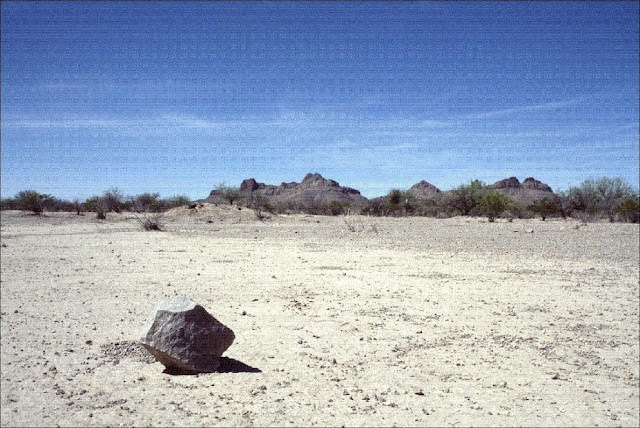 Scientists state the territory has seen an unusually great number of falling meteorites. This could be because of increased magnetism levels observed in the area. In July 1970, U.S. military launched an Athena test missile near Green River, Utah toward White Sands. Missile Range lost control and fell in the Mapimí Desert region. When the rocket went off course, it was carrying two small containers of cobalt 57, a radioactive element. After one month of search, the local farmers found and reported the crash in the Northeast corner of the State of Durango. Once the rocket was found, a road was built, and the missile wreckage and a small amount of contaminated top soil were transported away. In consequences the US Air Force recovery operation found a number of myths and legends relating to the area arose. A local resident hired to guard the crash debris during recovery operations supported spread these rumors. Moreover, legends include "strange magnetic anomalies that prevent radio transmission", mutations of flora and fauna, extraterrestrial visitations. There are lots of stories of aliens and unidentified flying objects in the Zone. People often get lost in the Zone. When this happens, sometimes tall blond beings appear out of nowhere. The phenomena is now claimed to have been first reported in the 1930s by Francisco Sarabia. A Mexican pilot who was first reported that his radio functions had mysteriously failed while flying over the area. Similar claims have been made by other persons who have visited the zone, that radio signals didn’t work and compasses were unusable. This zone is sometimes compared to the notorious Bermuda Triangle, as both are located between parallels 26 and 28. 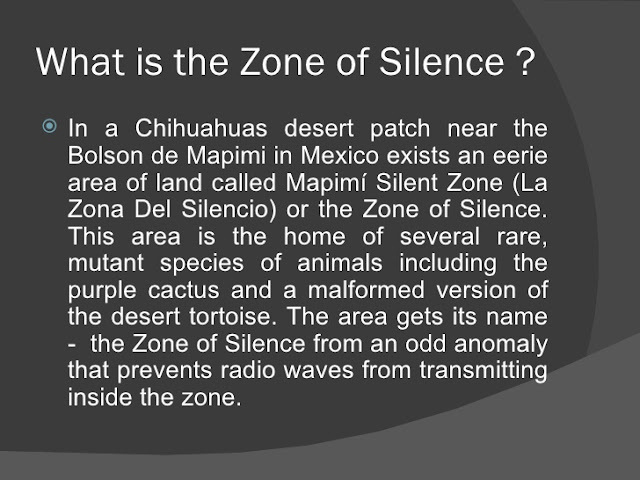 People come from all over the world to experience this silence zone to look for the ever illusive. However, sometimes attempt communication with otherworldly beings. Nevertheless, when it compasses and communications equipment is shown to work accurately in the zone. The local paranormal enthusiasts claim that "the zone moves around". 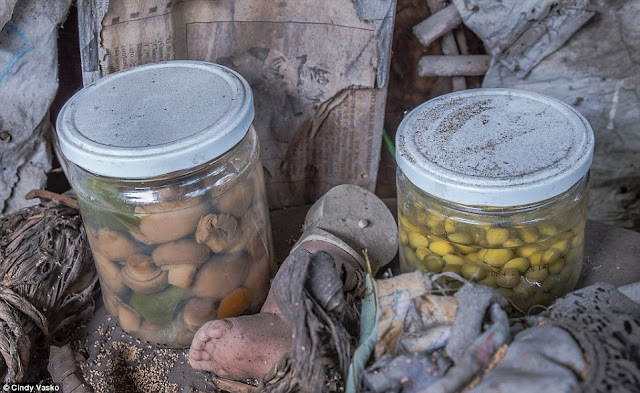 Residents, who do not accept the zone's existence, call such enthusiasts "zoneros" or "silenciosos", and say their activities have an adverse effect on the region. The Zone’s overall effects are disputed. 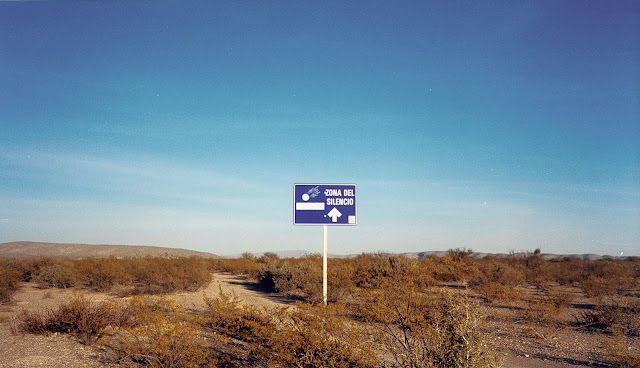 However, without any doubt, this zone sits on the borders of the Mexican states of Chihuahua, Durango, and Coahuila, has an abundance of celestial activity including, visits from UFOs and extraterrestrials. 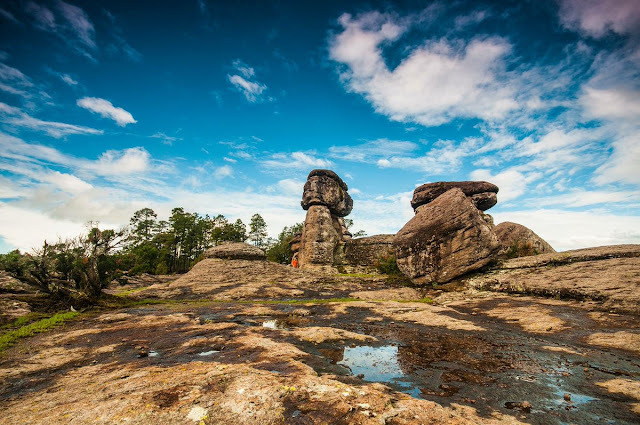 This is a starkly beautiful and compelling part of the world, but it is remote: Escalón has fewer than 1,000 inhabitants, and Ceballos has just over 3,000. 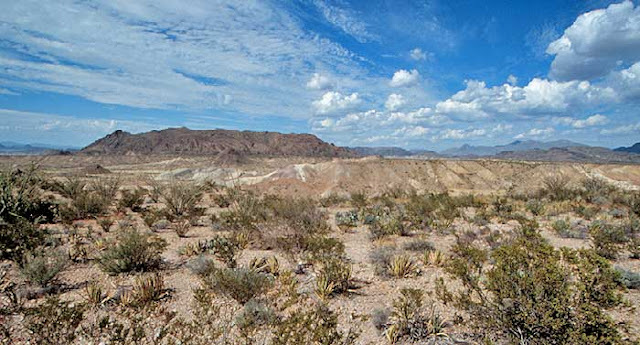 Their populations diminished as passenger rail service was abandoned and young people moved to the city or the U.S. Other than a few ranches, the desert itself is essentially empty. 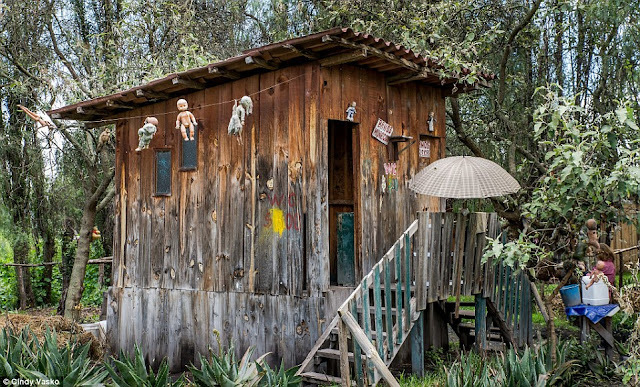 The area has under-explored delights, such as a hacienda abandoned over a century ago, during the tumult of the Mexican revolution, and thermal springs tucked into a cave. If you’re brave enough then come and lost in one of the weirdest location found on earth. 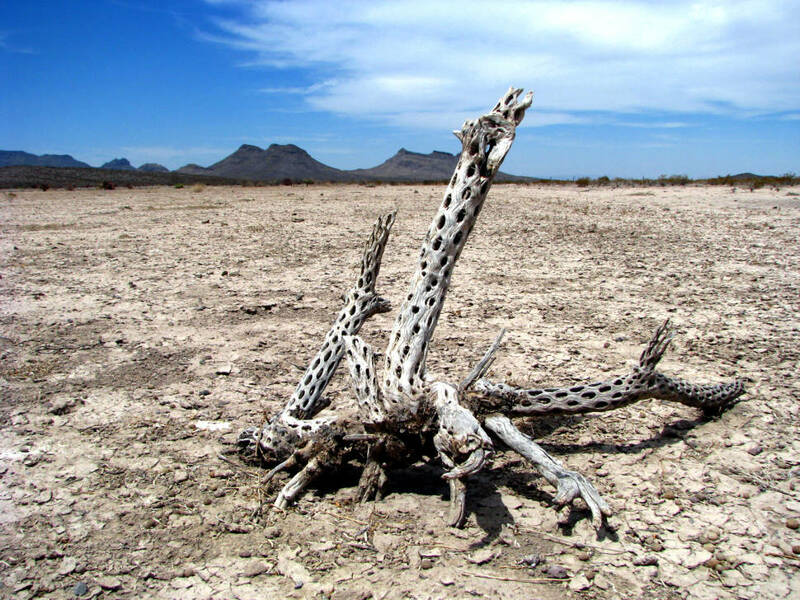 This is dry desert and dry season starts between Nov till May. 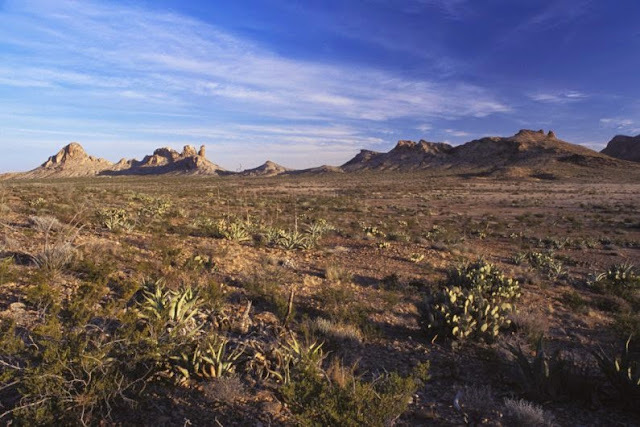 This is an area surrounded by mesquite, cactus, and guamis—brilliant yellow flowers resembling buttercups. Even so, the legend is now being used to help promote tourism in the region. Other claims are that the area attracts meteorites and causes various mental problems.